In reading the Power BI blog, it appears Microsoft has just changed what Power BI is. Since Power BI’s introduction last year, Power BI was a series of add-ins to Excel, which I liked to call the four powers, Power Pivot, Power Query, Power View and Power Map, and a web component. For people who weren’t interested in the web component, the most of the features listed in Power BI are available to anyone who has Office 2013 or Office 365. That now appears to have changed. Microsoft now says that Power BI is a Cloud Based service, and doesn’t mention Excel at all. As I documented here, Microsoft released Power BI Designer as a web application and a stand alone application. It has been freely available since December 18, 2014 to anyone living in the US. This was the first step away from Excel as you no longer needed Excel to create dashboards. In the January 27 announcement, Microsoft has completely broken away from Excel. Now Power BI is new, and the new Power BI is the Designer of December. The old restrictions still apply. Sorry, if you are not in the US, you can’t use Power BI Designer aka the new Power BI. You can get an iPad version of the app in the Apple store and the Surface version in the Microsoft store, but phone support is not yet available for either iPhone or Android, but they are slated for release later this year. It appears the mall is not the only place having sales in January. Microsoft just announced a major price reduction in Power BI too. Here’s the previous pricing model, which I saved from Microsoft’s website, just in case the Power BI webpage changed, which it did. Here’s the new pricing model ,which doesn’t fit very well on my webpage. To save you having to click on it, I will cut to the chase. Power BI is now $9.99. Now that they product is targeted to the masses, the price isn’t an even number, just like everything Not Sold In Stores. It stands to reason that dropping the price will help in the wider adoption of Power BI. The previous pricing made Power BI much more expensive than Office 365, which was probably a tough sell to many IT managers. What’s Next with Power BI ? To be honest, I have no idea what Microsoft is planning next. This announcement marks a big break with the past, which I guess we could call Power BI 1.0. The new direction to a standalone and web product makes Microsoft look more like its competitors, which I am sure was the idea. Personally I thought the break with Excel was quite surprising as I thought the plan was to leverage the knowledge of the current user base, so I didn’t expect it. I wonder if they are going to rebrand the four powers in Excel? Based on today’s announcement I wouldn’t be surprised, and I will be watching Microsoft closely to see what happens next. Power BI Designer is available both as a web application and as an desktop application which you can download to your PC. As you might have surmised, the two versions are mirrors to one another when it comes to functionality, with the biggest difference is the need to upload the results. The local version allows people who have an older version of Excel loaded to do Power View-like report functionality which they may not be able to do with the version of Excel they have. If you want to get started with Power BI Preview and you live in the United States, click here www.powerbi.com/dashboards . 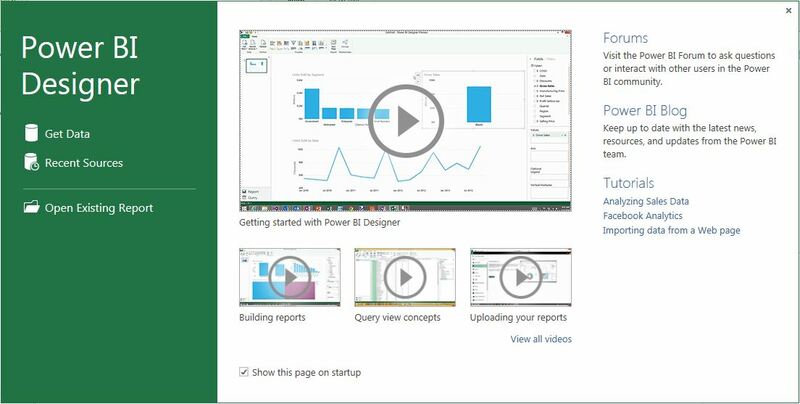 You don’t need to be a current Power BI customer to download and use the preview. The best way to learn how to use it is through the videos which Microsoft has included on the application start up screen shown below. I highly recommend watching them as they succinctly describe how it works. This product is still in preview, so there are some things that you can’t do, like change the colors. It was also meant to be non-developer friendly, so Power BI Designer picks a lot of things for you, and then you can change them afterwards. This model may be a little disconcerting if you don’t care about line charts, which seem to be the default. Microsoft created this program with the intent that you would be uploading the finished product to a Power BI tenant, it isn’t designed to have any native security or data refresh. This is not Excel, as the files you save in Power BI Designer have the suffix PBIX, so you have to have Power BI Designer to open these files. The steps for creating a dashboard are identical to how the Power BI Designer works with the online preview. First you need to select a data set, which can be from nearly anywhere–Azure, HDFS, Facebook, SSAS, Sql Server, MySQL,Sales Force, csv, to name a few—and then it will attempt to visualize your data sets for you. If you don’t like the visualization, most likely a line chart, which was defualt selected you can select a different visualization format, such as a treemap, funnel chart or any of the different options. To complete the dashboard, merge your selections onto one screen by tiling smaller visualizations onto a dashboard. The data displayed on the dashboard is contextual, so if you change the value all of the corresponding visualizations will change along with the selection. Microsoft is just now rolling out with Power BI Designer, and like Ronco’s ginsu knives, there are a lot more things planned for the product in the future. Here’s a list of suggestions made so far. If you think the product really needs something, go tell Microsoft as it appears they are actively monitoring the feedback. When they do release something I find noteworthy, I’ll let you know in a later post. On Thursday, I have the opportunity to talk about parts of Power BI which reside outside of the Excel. I’ll be showing the some of the web components of Power BI and how to use them. Because the install base of the Power BI tenant is not nearly as high as the number of people who have used the Power BI components within Excel, this webinar will highlight the more exotic features. When I signed up to do this webinar, I planned to showcase forecasting and hindcasting as they are neat ways of visually showing predictive data analytics. Having used them before, I thought that demoing their capabilities once again would be a good way to show some of the neat reasons that you might want to use Power BI. Unfortunately, I won’t be able to demo these features. Imagine my surprise when I saw this announcement from Microsoft stating that the Power BI Forecasting feature was “offline for maintenance”. Since the announcement came in December, I originally thought that this would be no big deal. Surely the feature would be back online soon. I thought wrong. The forecasting feature is gone. When using Power BI, the option never appears. It’s like it never existed. In the excitement to release Designer, the non-excel dash boarding feature, the disappearance of the previously released tool has not been highlighted, until now. When the Forecasting feature was released in May, there was a lot of buzz about the fact that Microsoft was able to release a great new feature in time to coincide with the PASS BA Conference. Well, the pulling of this feature is the Nimbostratus of the cloud release, bringing rain. There are a lot of features available for me to show in Power BI, so I still have a lot of demo material, but I find this development to be rather troubling. Here’s hoping that this giving and taking of features in Power BI doesn’t repeat itself.